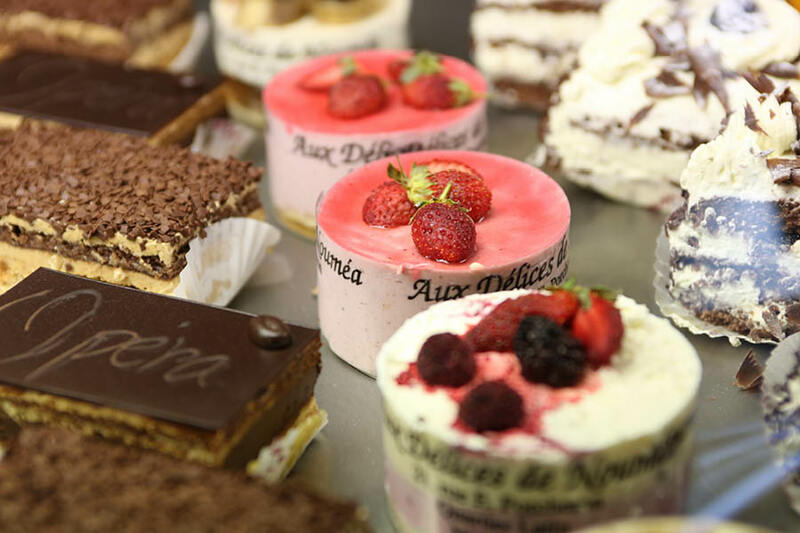 If you have ever experienced and loved the culture and lifestyle while visiting France, and if your mouth waters whenever you think about fresh baguettes and pastries baked in a French Bolangerie, then you might be surprised to learn that you can easily revisit the entire experience without having to fly all the way there. Only a couple of hours away in the heart of the Pacific awaits French culture, cuisine and lifestyle mixed with some South Pacific magic. If you have never been to France and want to get a taste of what it’s like, then New Caledonia is the perfect starting point for a holiday that will treat your senses. From the colourful capital, Noumea, with its trendy cafes, nightclubs and activities, to the secluded beaches and luxury resorts, this country is a haven for foodies and sun-seekers that want something unique and different on their South Pacific holiday. I couldn’t believe how close Noumea is to Australia. I departed from Brisbane, the closest Australian capital, which is only 2 hours flying time (it is 3 hours from Sydney and 4 hours from Melbourne). The flight left Brisbane at 8:35pm and we were served a delicious meal accompanied by French wine and good coffee. So far, the trip deserved a gold star from a self–confessed “foodie”. I had no issue with communication as virtually everyone we had contact with spoke English very well. However, as the journey progressed I became more confident with the art of conversation in French and by the end of my long weekend I felt quite pleased with my delivery of words and phrases that I had learnt while living in France many years ago. Arriving in the contemporary Tontouta International Airport was easy to navigate and our ride was ready for our arrival. We climbed aboard a modern Renault 12 seater van and were whisked off to The Bourail region along the north-west coast. As the van pulled into the resort driveway we experienced a gorgeous reception from the bubbly staff at the Sheraton New Caledonia Deva Hotel & Spa. After a quick check-in signature and luggage ID, the golf carts transported us to the waiting luxury within the hotels bungalows. The interior of my bungalow greatly excited me. Almost brand new with exquisite colourful fabrics and natural textures making up the décor of a contemporary round room with spacious living and a separate bathroom, I think it was the Cleopatra bathtub that impressed me the most. That was until I lay upon probably the most comfortable mattress I have ever slept on which was situated under a floaty canopy of lacy drapes. This morning I enjoyed sitting quietly on my private balcony with the tropical garden views, listening to the pretty bird songs. The hotel room was very spacious and comfortable with quality linen and amenities. With the limited time we had left we commenced the day’s activities after a scrumptious buffet breakfast oozing with French crepes and pastries – still in heaven! Vincent, our chaperone, guided us along the tropical path leading to Le Piscine Naturelle (the natural pool) for snorkelling in what can only be described as a tropical aquarium paradise. Abundant with colourful fish and coral, this was one of the highlights of the island and it was so easy to get to and experience. After lunch, Jean Christophe took us on a 2-hour tour of the island including the natural cave, the island village, traditional outrigger boat bay, the monument to the French arrival and the ruins of the penal colony. The history, lifestyle and culture lessons along the way gave me a better appreciation for the island and the nation. An afternoon swim in the resort’s infinity pool was simply idyllic but we had to say our farewells to our hosts and keep moving as the capital, Noumea, was waiting to be explored. It was just a 5-minute drive from Magenta Airport to Le Meridien Noumea, yet another outstanding hotel, this one located beside the famous Anse Vata Beach. The hotel is currently renovating their rooms and suites so within months the entire portfolio will be finished in the contemporary décor and colour schemes. The Grand Casino is within walking distance, so too is the famous restaurant and nightlife strip of Baie de Citron (Lemon Bay). Our hosts introduced us to Rbar, a funky Tapas Bar and Club where the who’s who of Noumea hang out. After a full day of discovery, we climbed onto what seemed to be the most perfect mattress and drifted off with great expectations for the new day ahead. In the clear light of the sunny morning that followed, I made a vanilla herbal tea and sat upon the day bed on my private balcony to admire the neat tropical gardens between me and the sea. The beach expanded into a large protected lagoon with crystal clear water, the white caps of the ocean in the distance breaking gently upon the barrier reef. We toured the resort after a delicious buffet breakfast, noting the family friendly suites that had views over the Dye Design golf course. A kid’s club is in the central heart of the apartment domain, offering not only entertainment for children, but a peaceful existence for their parents also. Our hosts generously served French Champagne in the cool shade of a tree near the tee off of the 18th hole. Located just metres from the beach, the bubbles were as refreshing as the breeze from the Pacific Ocean. Then it was time to try the Sand Beach Grill for lunch where the guests literally sit at dining tables upon the white sand with vistas across the blue lagoon. My crab and tomato salad, followed by half grilled lobster and later, an icy Champagne granita accompanied by the best fruit salad I have ever tasted, would have to be one of my most memorable meals of the holiday. With time ticking we bade our farewells to our amazing hosts but not before a final sample of local rums at the resorts bar. We had time to rest and digest our lunch on the drive to Magenta Airport, Noumea’s domestic airport, for our journey to Ile des Pins (Island of Pines). Following our short flight to Isle of Pines we were greeted in the quaint regional airport by friendly islanders with beaming smiles. Within minutes of landing we made our grand entrance into Le Meridien Ile des Pines. After a quick check-in and change I was seated in a private area on the terrace adjacent to the swimming pool and lagoon beach participating in a French Champagne and wine tasting with a sensational platter of tapas creations before me – I was in heaven. After Drappier Champagne served in the French Presidential Palace and Delaille Unique 2013 Sauvignon Blanc that was voted world’s best, we moved to the dining room. I ordered an entrée size Foie Gras (ducks livers) with brioche and washed it down with another fine wine along with some homemade sweeties that had magically arrived on a share platter. In preparing for bed I reluctantly removed the gorgeous welcome message from my bed covers, extinguished all the lights and melted into yet another perfect mattress for a seamless night’s slumber. The sun was shining and Anse Vata Beach was a hub of activity with stand-up paddle boarders, snorkelers and swimmers enjoying the perfect conditions. We watched them from our breakfast table as once again the French cuisine lured us to the buffet. Today we had many Noumea hotels to inspect and each greeted us with warm hospitality. There are independent hotel groups like Chateau Royal and Hotel Le Lagon Noumea plus large multi-national brands such as Ramada and Hilton. Each one offers guests something different depending on budget and needs and all are either along the waterfront or just a couple of blocks away. We finished our site inspections at the Hilton Residences and joined Julie, our Hostess, for another delicious meal to finish our tour. It is hard to say goodbye to such an amazing destination. Noumea is a buzzing city of 100,000 people and the country itself offers diverse environments from north to south and east to west, each with something to arouse the interest of individuals seeking adventure or relaxation. But wherever you go in the culturally rich country of New Caledonia, you are never far from the amazing azure blue and aqua green of the mesmerising sea.